The Arizona Reined Cow Horse Association is an organization founded to promote and perpetuate the Spanish vaquero traditions of training and exhibiting highly skilled cow horses. Since its inception in October 2005, the AZRCHA has established working relationships with affiliates of the National Reined Cow Horse Association as well as with local and national equine associations. These relationships enable the AZRCHA to host reined cow horse events and clinics at premier horse show facilities throughout Arizona. These events include the Arizona Nationals, Shamrock Show, Gilkerson Memorial, Tall Pines and the Fall Championship. We welcome anyone interested in learning, watching and (most of all) participating in the reined cow horse tradition. Our website is regularly updated with upcoming shows and clinics. DOWNLOAD MEMBERSHIP FORM ABOUT WHAT WE DO . 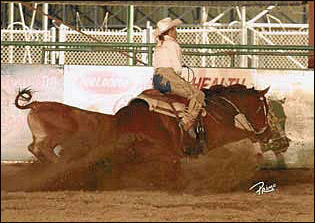 . . Reined cow horse classes are a combination of two different disciplines: reining and cutting. The first part, the reining, is referred to as "dry work" while the second part, the cutting, is called "cow work." It is this combination of "dry work" and cow work" that makes watching a reined cow horse class so exciting! DRY WORK Dry Work The dry work phase requires each exhibitor to execute a predefined pattern. When guiding the horse through a combination of circles, lead changes, spins and stops, the rider must demonstrate the horse's physical ability and willingness to respond with little or no apparent resistance. The horse, in other words, must appear to be "willingly guided" through each maneuver in the pattern. COW WORK Cow Work A cow is introduced in to the arena at the beginning of the cow work phase. The exhibitor must demonstrate the horse's ability to control the movements of the cow by completing three maneuvers in order. The first maneuver, "boxing" the cow, requires the horse and rider to hold the cow against the short wall of the arena. The second maneuver, going "down the fence," involves directing the movements of the cow down the length of the arena, turning it once in each direction. The third maneuver, "circling" the cow, requires the horse and rider to smoothly direct the running cow into a 360 degree circle, once to the left and once to the right. . . . AND HOW WE DO IT The AZRCHA offers several different divisions and classes that cater to all levels of riding, from beginner to advanced. There are four divisions: Bridle, Hackamore, Two-Rein and Limited. BRIDLE DIVISION: This division is open to horses of any age. Every horse must be shown with romal reins and an approved bit. The Open Bridle Class is open to any rider. The Limited Open Bridle Class is open to any rider that has not won more than $15,000.00 in reined cow horse and limited age events. The Non Pro Bridle Class is open to any approved Non Pro rider. The Novice Non Pro Bridle class is open to approved Non Pro riders who have not won more than $7,500.00 in this or any other NRCHA class. The Youth Bridle Class is open to riders 18 years of age and under. For safety reasons, Youth riders are not allowed to exhibit stallions in any Youth class. HACKAMORE DIVISION: This division is open to horses five years of age and under that have never been shown in the bridle or two-rein. The rider must use closed reins and both hands must be used on the reins. The Open Hackamore Class is open to any rider. The Limited Open Hackamore Class is open to any rider that has not won more than $15,000.00 in reined cow horse and limited age events. The Non Pro Hackamore Class in open to any approved Non Pro rider. TWO-REIN DIVISION: This division is open to horses of any age that have not been shown in the bridle down the fence in any judged classes or events. 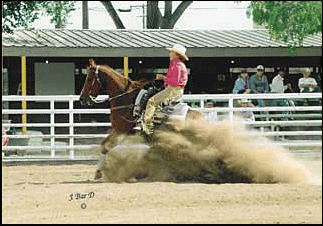 A horse may only be shown for one year in this class and the rider must only use one hand on the reins. The Open Two-Rein Class is open to any rider. LIMITED DIVISION: The Limited Division is the beginner division. Work in this division consists of a reining pattern and single cow work (boxing) on one end of the arena. Horses five years of age and under in this division may be shown in the snaffle or hackamore. Horses of any age may be shown in the two-rein (for one year only) or the bridle. Riders in this division cannot have shown down the fence three times. The $5,000 Non Pro Limited Class is open to approved Non Pro riders who have not won more than $5,000.00 in lifetime earnings. The Youth Limited Class is open to riders 18 years of age and under.